A description of a very novel electrical violin which has no sounding board, but which transmits its vibrations to a regular audio amplifier and reproduced from the regular radio speaker. Ever since the advent of the thermionic vacuum tube, engineers, and others interested in musical instruments, have endeavoured to create a single instrument that would simulate all known instruments both as regards tone quality and frequency range, or pitch. And the efforts of these pioneers have not been in vain. Today, there are available a host of musical instruments designed to produce the lowest notes of the bass viol and drum to the highest notes of the piccolo with the intensity of an electric organ. Notwithstanding these remarkable achievements, there exists a field which has not yet been developed to the proportions it deserves. This field covers the design of, what might be called, single electronic instruments. By this phrase we mean the design of electrical instruments which reproduce the tones of only a single instrument – even better than the original. And example of one of these devices is illustrated in this page. As may be seen by reference to any of the photographs, the device is a skeleton violin, arranged to change the vibrations of the strings into electrical impulses, which may, in turn, be amplified by a conventional amplifier, such as used, for example, in any radio receiver. This new violin, which has no sounding board, is the invention of Mr. Victor Pfeil, well-known violin maker. Instead of the usual tone chamber, or sounding board, this violin has only a light skeleton frame. Concealed directly under the bridge, as shown in one photograph, is a small electromagnetic pickup. The magnets of this pickup are directly under a small strip of iron, or similar magnetic substance, which is set in motion when the bridge is vibrated by the strings. Thus, the magnetic flux between the pole pieces of the magnet is varied which, in turn, generates a voltage across the terminals of the coil wound around the pole pieces. Furthermore, the variation in this voltage is exactly in accordance with the variation of the bridge which, in turn, depends upon the mode of vibration of the strings. The magnet coils may be connected to the amplifier exactly as a phonograph pickup or microphone is connected, and the resultant reproduction heard from the loudspeaker. The quality of the output, of course depends upon the quality of the amplifier associated with the “electric violin”. However, it might be mentioned that music from this violin has been broadcast through a nationwide chain of stations of the National Broadcasting Company; both engineers and musicians, alike, have marvelled at the tone. This instrument has several advantages over the more common violin. First, a variable tone and volume control permits control of timbre and volume that will fill large auditoriums under optimum conditions; second it is claimed that this electric violin capable of producing the pure tones nearly over the entire audio-frequency range of the instrument, something the usual violin is incapable of doing – even including the old masters. This device will soon be available on the market in the form of cellos, violins, guitars, ukuleles, and other stringed instruments, for the fundamental principle of operation is the same for all. This invention relates to musical instruments and it has particular reference to a stringed instrument having a transforming and amplifying device mounted in part there on. The invention contemplates, the provision of a stringed musical instrument simulating any well known type, which may be played manually for directly producing a pulsating electric current which may be amplified and transformed into sound energy reproducing the notes of the instrument at a remote point. The invention comprehends a special construction of musical instrument which essentially produces a new instrument adapted for producing sound vibrations similar to any well known type of musical instrument, in which a stick mounts the usual finger board through the string supporting and tensioning devices including the use of a special bridge construction mounted for free movement relative to the stick so that it may be adapted for operating a suitable electric system constructed to produce the sound corresponding to the vibrations of the strings and the bridge. The invention includes the provision of a special bridge construction for stringed instruments differing materially in construction and the manner and method of mounting on the instrument from the ordinary type of bridge now in general use. More specifically, the various objects of the invention are attained by resiliently mounting a string bridge and transforming device on the instrument and positioning an armature between the bridge and transforming device in such manner that the vibration of the strings of the instrument creates a direct and proportionate vibration in the armature, which, in turn, develops a pulsating electric current in the transforming device whose wave form is analogous to that of the note produced. The pulsating current is amplified to any desired volume, and again transformed into audible sound waves similar in pitch and quality to, the original sounds, produced by the strings. …The new musical instrument selected for example is similar to an ordinary violin, in that it includes a scroll, string securing and tensioning keys, and neck, upon which is mounted a finger board. For a reason subsequently to be explained, however, the usual body portion or resonator box of this type of stringed instrument is omitted, being replaced by a suitably turned and finished stick of wood, which need be of no greater width and depth than the neck. At one side of the stick and adjacent the junction thereof with the neck, is a support which projects outwardly and serves as a hand rest. At the other end of the stick is a projecting chin rest and a tail piece mounted in the usual manner, together with a button to complete the assembly by means of which a string securing means is provided. Extending between the scroll and button are a plurality of strings, the number and character of which will depend, of course, upon the type of, instrument. These strings are supported between the ends of the finger board and tail piece by means of an upstanding member or bridge, which advantageously is constructed and mounted in accordance with the principles hereinafter set forth. Beneath the bridge, and advantageously serving as a support therefore, is a device for transforming the vibrations of the strings into electrical energy having the same vibration or wave characteristics. A pair of wires, so encased as not to interfere with the musician, lead from the energy transforming device to the primary coil of an electrical transformer. The secondary terminals of the transformer are in turn connected to an electrical amplifying system including such well known devices as electron tubes, audio transformers, batteries, and a loud speaker, all of which are represented. It is to be understood that any well known type and construction of amplifying system may be used with this new instrument. Victor A. Pfeil, Orange, N. 3., assignor to Crëszentla A. Neil, West Orange, N.J. This invention relates to stringed instruments and it has particular relation to a stringed musical instrument combined with transforming and amplifying mechanism installed in conjunction therewith. The invention contemplates the provision of a stringed instrument simulating any well known type which is played manually and is designed for directly producing a pulsating electric current for transformation and amplification into sound energy in the form of musical notes of the instrument at a remote point. In one embodiment of the invention a special construction of musical instrument is provided and in which a stick of wood, or other suitable material, is employed for mounting a conventional finger board, together with a special bridge construction for receiving strings stretched thereover. The bridge is mounted for oscillatory or vibratory movement with respect to the stick in order that it may operate and cooperate with an electric system constructed to reproduce the sound corresponding to the vibrations of the strings and bridge. The invention includes special construction of bridges for stringed instruments differing materially in construction and method of installation from conventional bridges of ordinary musical instruments. In referring to means for producing a magnetic field, it is to be understood that electromagnetic devices are intended to include magneto electric devices. That is, electrical energy can be induced through an electric circuit in which electromagnetic means is incorporated for varying a magnetic field according to vibrations of an armature, or a permanent magnet and coil can be used in which the field of the magnet or winding of the coil is provided with an armature vibrated by vibrations of the musical instrument string to create the desired electric pulsations. In arranging the elements of the instrument embodying the invention, a bridge and transforming device are mounted upon a suitable supporting portion of the instrument, and an armature composed of soft iron is mounted in conjunction with the bridge and transforming device in such manner that the vibrations of the strings of the instrument create direct and proportionate vibrations in the armature which, in turn, develop a pulsating electric current in the transforming device whose wave form is analogous to that of the note or sound produced. The pulsating current is amplified to any desired volume and quality and again transformed into audible sound waves similar in pitch and quality to the original sound produced by the strings. More than one amplifying device can be applied in the structure disclosed..
…A musical instrument is provided somewhat similar to an ordinary violin in that it includes a scroll, string securing and tensioning pegs, and a neck upon which a finger board is mounted. In this structure the entire body portion or resonator box, usually included in a musical instrument of this general type, is omitted arid a suitably turned and finished stick of wood or insulating material is substituted therefore. In fact, the stick is substantially a continuation of and is approximately the same size as the neck. In order to facilitate the manipulation of the fingers along the finger board and to provide for proper resting of the instrument beneath a person’s chin, a lateral hand rest is rigidly mounted upon the stick adjacent the neck, and a lateral chin rest is rigidly mounted upon the rear or inner end of the stick. 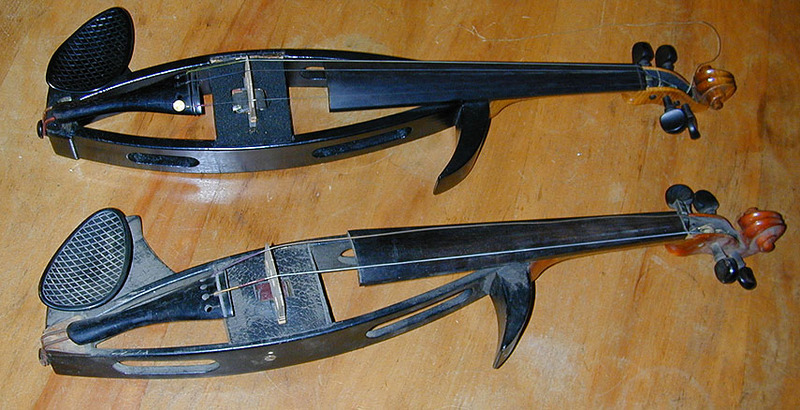 A conventional violin tail piece having a loop fitting over a button at the end of the stick supports the rear ends of the strings while the strings are connected for adjustment upon the pegs at the outer end of the neck. While this description refers to the manner in which the instrument such as the violin is assembled with respect to the strings, it is or course possible to apply the same principle of construction to various other types of stringed instruments. It is known that the quality of music emitted by violin depends largely upon the character and age of the wood of which the resonator box is composed. New violins do not produce the better quality of music because the wood is not of proper character, but tends to set up higher harmonic vibrations which to the ear are inharmonious with the fundamental. In the kind of instrument described herein the resonator box is not used, thus preventing the development of undesirable harmonies. This instrument produces only weak sounds resulting wholly from the vibrations of the strings while the music to be produced is transmitted to the amplifier in the form of vibration directly from the bridge and armature. Thus, the amplifier produces or presents the music of the instrument in the desired manner. Pfeil seemingly never reached the final manufacturing stage or, only made very few instruments. Pfeil's name is only recorded later alongside one Albert E. Allen. Allen and Pfeil produced electric stringed instruments - certainly ukuleles, violins violas and from an image in Radio Craft magazine, cellos too. Their work was done in Orange, New Jersey (at) Allencraft Laboratories.